I mentioned my then-unnamed robot project in my last post. While I still haven’t managed to finish my write-up for it, I did finally upload some photos to Flickr, just to build some momentum. 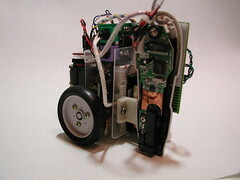 The short of it: the robot is designed to be a teaching aid for little kids to learn the basic concepts of programming. Instructions are encoded onto tiles over which the robot moves; these tiles are keyed like puzzle-pieces to provide a physical representation of the language’s syntax. It’s based on a Propeller microcontroller and uses a hacked PS/2 CueCat scanner to read the barcodes.